Water is an important part of body fluids and each cell depends on water to function normally. The daily amount of water that your child needs depends on various factors such as age, gender, weight and activity pattern. 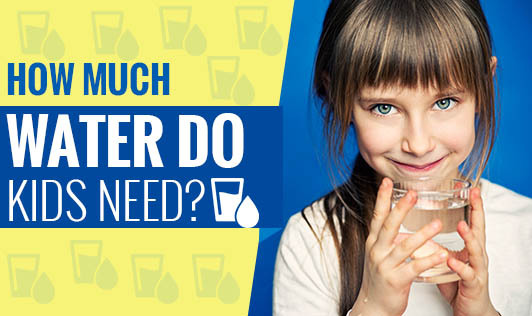 Kids Total Daily Water Requirements: Total water includes all water contained in food, beverages, juices and drinking water. Getting plenty of liquids daily helps to regulate a child's body temperature. It also helps to prevent constipation by keeping the stool soft, prevents urinary infections by flushing toxins and bacteria out of the urinary tract and enhances the body's immunity. Infants stay hydrated by drinking their formula feed or breast milk, but children on a mixed diet, require plain water to supplement the water that they derive from food. Children are more likely to ignore their thirst when compared to adults. In fact, by the time your child realizes that he/she is thirsty; they probably have already become dehydrated. This happens especially during warm weather. Special care is required if your kid is involved in sports practice, games or work outs. It is important for your child to drink water before, after and during physical activity. So, don't forget to give your kid a water bottle! It is important to cut back on caffeinated beverages such as tea, coffee and soda as they can dehydrate the body faster. Dehydration can make your kid unwell. So, keep the water bottle handy to replenish your body often. Offer your kids tender coconut water, juices, soups, milk and buttermilk to keep them well hydrated throughout the day. Provide fresh fruits and vegetables like cucumbers, melons, plums, peaches, tomatoes and celery as these contain a high water content. At the same time, make sure you do not go overboard by offering your kids too much water as it can decrease the appetite of a growing child and result in poor nutrition. So parents do get your children into the habit of drinking enough water through the day!